Crowns are full coverage restorations that protect broken down or compromised teeth. Unlike fillings that go inside of a tooth, a crown goes around it entirely, distributing pressure evenly across the full surface during biting and chewing. A crown provides a strong outer layer that can protect the more sensitive inner portion of the tooth. This protective covering allows the tooth to continue functioning for as long as possible. A porcelain crown is a wonderful way to protect your tooth and improve the way it looks. We use a crown laboratory to custom design each crown to our individual patients. Crowns are also ideal for managing aesthetic concerns that impact your front teeth. When restoring teeth, our goal is to be conservative. Dr. Sekhon will place a filling if that will be enough to maintain the integrity of your tooth. Occasionally, though, the decay or fracture of a tooth may be too far advanced. 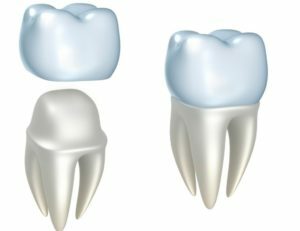 In such a case, a crown will help to preserve the strength of a tooth better than a filling can. Our in-house CEREC equipment allows us to complete many aspects of a crown procedure in just one appointment. CEREC crowns are ideal for the teeth further back in the mouth The back teeth are the ones primarily used for chewing so they often benefit the most from having a strong CEREC crown placed. Each one is custom matched to your smile’s color, for a natural looking outcome. If the thought of having a crown made makes you feel nervous, ask us about oral sedation! Oral sedation can make any dental procedure much more comfortable than you might imagine. Financing options are also available at our office. To learn more about how a durable dental crown could benefit your smile, contact us at Gallery Dental to set up an appointment. All treatment is provided by a general dentist. For more complex cases, we often refer our patients to a specialist for treatment.